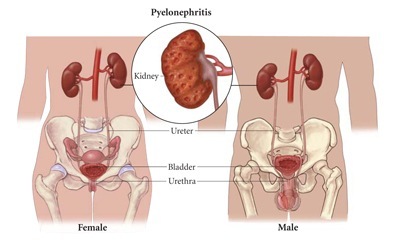 Pyelonephritis is an inflammation of the kidney and upper urinary tract that usually results from noncontagious bacterial infection of the bladder (cystitis). It presents with dysuria (painful voiding of urine), abdominal pain (radiating to the back on the affected side) and tenderness of the bladder area and the side of the involved kidney (“renal angle tenderness”). In many cases there are systemic symptoms in the form of fever, rigors (violent shivering while the temperature rises), headache and vomiting. In severe cases, delirium may be present.